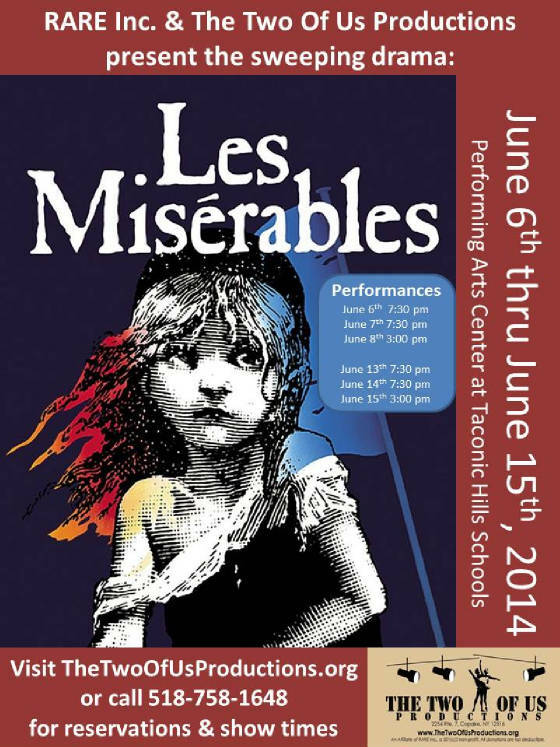 LES MISERABLES was performed at the Performing Arts Center at Taconic Central School in Craryville, NY. We had a great run of 6 wonderful performances, each one with a full & very enthusiastic audience. You can see all the awards by clicking here and looking for LES MISERABLES by The Two Of Us Productions. Beginning in 1815 and culminating in the 1832 June Rebellion in Paris, the riveting story of Les Miserables follows the lives and interactions of such beloved characters as: Cosette, Marius & Eponine; the rascally innkeepers the Thenardiers; the untimely death of Fantine, the struggles of ex-convict Jean Valjean; and the relentless pursuit of Valjean by police inspector Javert. In fact, our opening performance on June 6th marks the 182nd anniversary of the popular uprising depicted at the Barricade in Act 2. The Two Of Us Productions is very pleased to bring this grand story and sweeping music to our Hudson Valley audience. Les Miserables won 8 Tony Awards and 5 Drama Desk awards, including Best Musical, Best Book and Best Original Score. The pace of the story line is brisk and the intensity of Hugo’s story of rebellion, imprisonment, love and redemption is fully supported by the rich music of Les Miserables, which we present in all it’s glory with our full orchestra. Les Miserables, The Musical holds a special magic for many people. At both Sunday matinee performances, June 8th & June 15th, we are offering a special photo-opportunity event. Stay after the show to meet & talk with your favorite characters from Les Miserables. Selected cast members will be available after the show for you to meet & to have your photo taken with them. We hope you enjoy this opportunity to speak to our wonderful cast, our director and our vocal director. 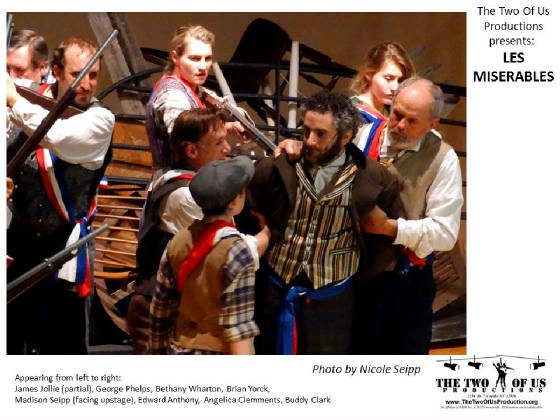 We are very pleased to be presenting this production with the support of the Taconic Hills Central School District, The Columbia County Council on the Arts, and our many local friends and supporters. We would like to recognize the Reformed Dutch Church of Claverack, St. John the Baptist Roman Catholic Church of Valatie, Valatie Community Theatre and the Hudson Valley Academy of Performing Arts for supporting this production. This event is made possible in part with public funds from the Decentralization Program of the New York State Council on the Arts, administered by the Twin Counties Cultural Fund in Columbia County by CCCA. We also gratefully acknowledge the support of Stewart’s Shops, Hudson River Bank & Trust, KeyBank Foundation and our very generous individual donors. Thank you to our wonderful cast and production team for all the creativity, hard work, and theatrical excellence that has brought Les Miserables to life. An integral part of our show is the music. Thank you to every orchestra member for your musicianship and commitment to excellence. Music is the heart of a musical and we are honored to have had the opportunity to work with so many fine singers and instrumentalists. "Awesome! Awesome! Awesome! This word does not even do justice to the performance of LES MIS last night by The Two Of Us Productions at Taconic Hills Performing Arts Center! It was as good , or better, than any other productoin of LES MIS that I have seen! ... Outstanding performance!" -- Kathleen K.
"Masterful pit, strong voices conquer Les Mis score ... you’ve gotta love the grit and gusto of The Two of Us. Producing this humungous ... musical on a limited budget with mostly non-pros ... Stephen Sanborn, director/conductor, and Constance Lopez, actor/assistant director, have not hesitated ... Although the company has other virtues, its big claim to your attention is that its musicals appear with a full, live orchestra." -- Marion Hunter, The Columbia Paper.
" The experience of being a part of LES MISREABLES with The Two Of Us Productoins was incredible. Many people I spoke with were so positive and it was an exciting adventure." -- Kristen L, Athens, NY. Produced by The Two of Us Productions and RARE Inc.